165 pages | 91 B/W Illus. With so many new lighting technologies available for a wide range of visual environments, how do you choose the options that best address the needs and improve the quality of life for various groups? 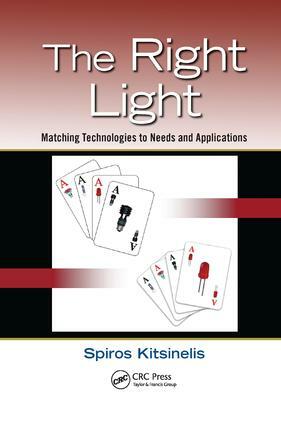 Focusing on applications and everyday use of light sources, The Right Light: Matching Technologies to Needs and Applications provides a comprehensive explanation of all light sources to be used as a guide to choosing the right lighting technology. The book supplies a quick overview of the main characteristics of the existing technologies in the market and suggestions for appropriate technologies for a range of applications from health related issues to safety and security. The author characterizes different lamp technologies based on the large number of parameters required when choosing a light source. He makes suggestions based mainly on the qualities of the light such as color/wavelength of the light, color rendering index of the source, and, in the case of white light, the color temperature. Other parameters such as the luminous flux or the lifetime may play a role in some cases. From the improvement of the quality of life of people in their working and living spaces, to road safety or treatment of medical conditions and from managing cancer rates to improving the lives of vision impaired people, the correct choice of light sources and the appropriate lighting design can indeed make the difference between comfortable and problematic everyday life or indeed life and death. Whether you design work spaces, public spaces, or living spaces, this book examines the different technologies and their properties in a way that allows you to find the correct lighting solutions and light related answers for any space.